Firearm magazines are an important and often overlooked part of a firearm. Many feeding problems can be traced back to the magazine. Keeping your magazine clean is just as important as cleaning the barrel of the firearm. Most magazines can be disassembled for cleaning and maintenance. Depress magazine release button on the receiver of firearm and remove magazine from firearm. Ensure that firearm is unloaded and safe. Take out any rounds that are in the magazine. Locate the "lock plate button" on the bottom of magazine or "floorplate". See Step 1 image. Depress "lock plate button" with a pointed object. When fully depressed, "floorplate" will slide all the way off of the magazine body. Use caution as there is a large spring inside the magazine that pushes up on the "floorplate". Proceed slowly to prevent losing parts or getting injured. See Step 2 image. Slide "floorplate" off of the magazine body and remove the "spring", "follower" and "lock plate". Set these parts down on a spread-out cotton rag. Inspect each part for wear, damage or dirtiness. See Step 3 image. Clean magazine body and the individual parts. Use Gun Scrubber spray if not overly dirty. Clean with the gun solvent and a brush if magazine is overly dirty. When finished, lubricate all metal surfaces with a fine coat of oil. 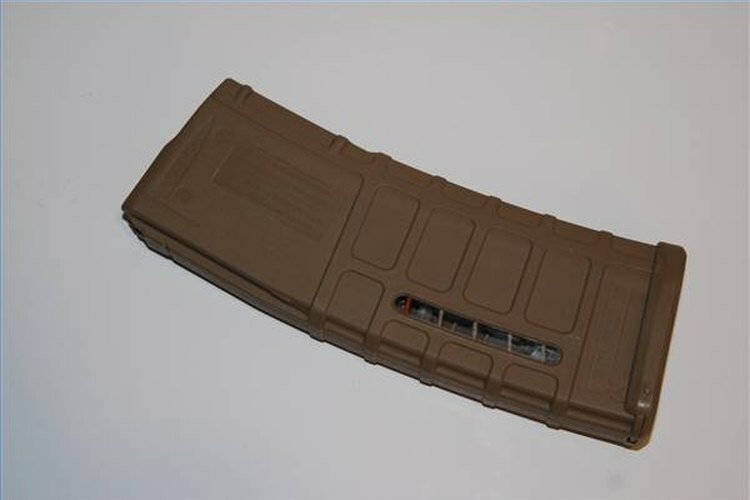 Do not use lubrication if the magazine is a synthetic model, like this Magpul magazine. Reassemble everything in the reverse order as above. Use caution when reinserting spring back into magazine body. When fully assembled, function test to make sure magazine operates correctly. Use caution when working with firearms. Obey all firearm safety rules. Wear safety glasses when working with springs. Wear gloves when using solvents.